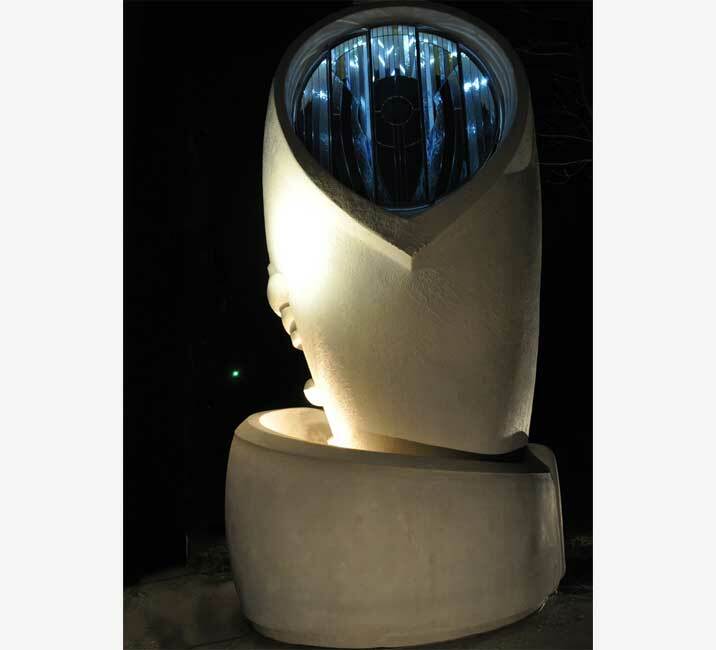 2015, architectural light weight concrete (GFRC) with polished, embedded automotive glass from Dodge cars and rear view mirror pieces in the parabola, 20 feet by 12 feet by 10 feet. 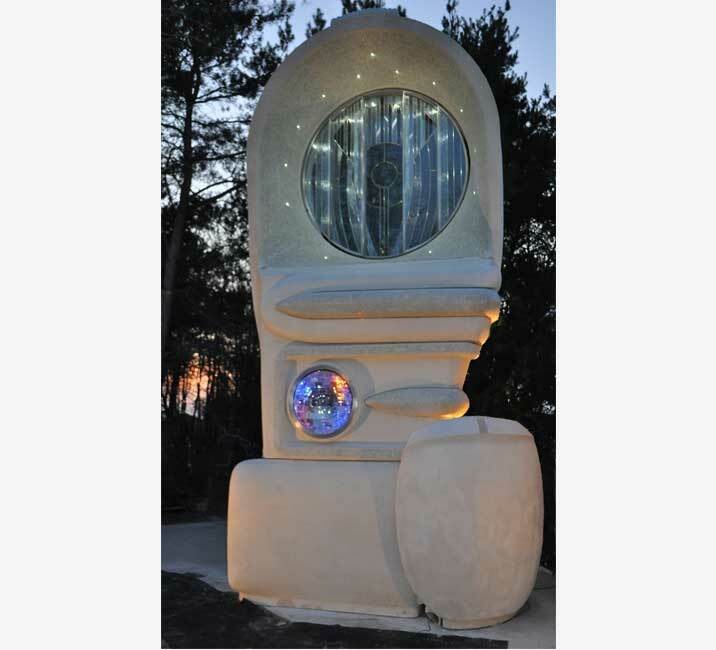 Light Dodger can be seen at the Reed Brothers complex -15955 North Frederick Road, Rockville, Maryland. 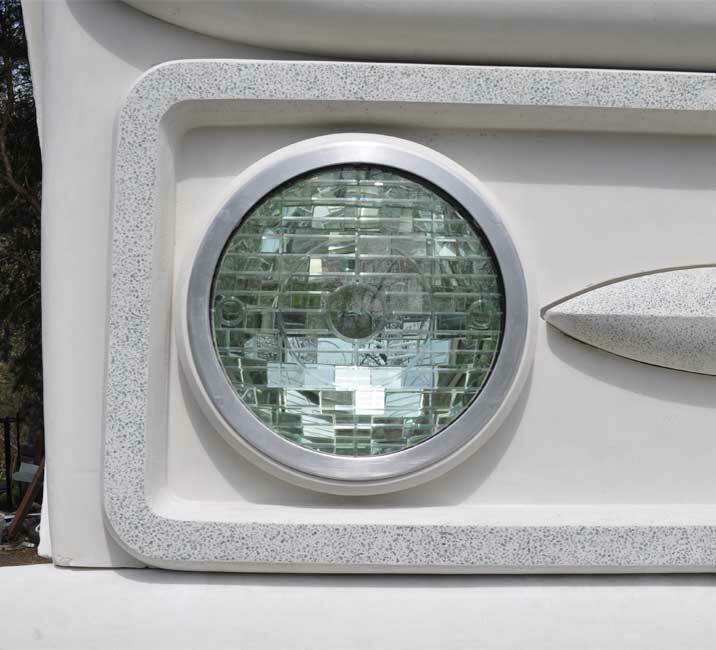 The Light Dodger is an abstraction of two vintage Dodge headlight designs. The Glass panels are IGU lead glass sandwiched with hurricane glass, louvered to spill wind gusts. 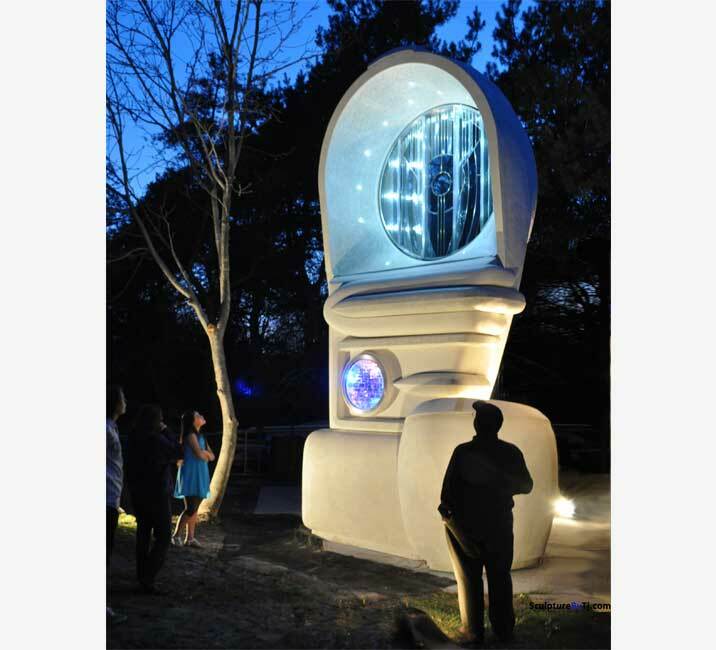 Tiny marine spec LED lights are embedded in the surface to illuminate the glass at night. 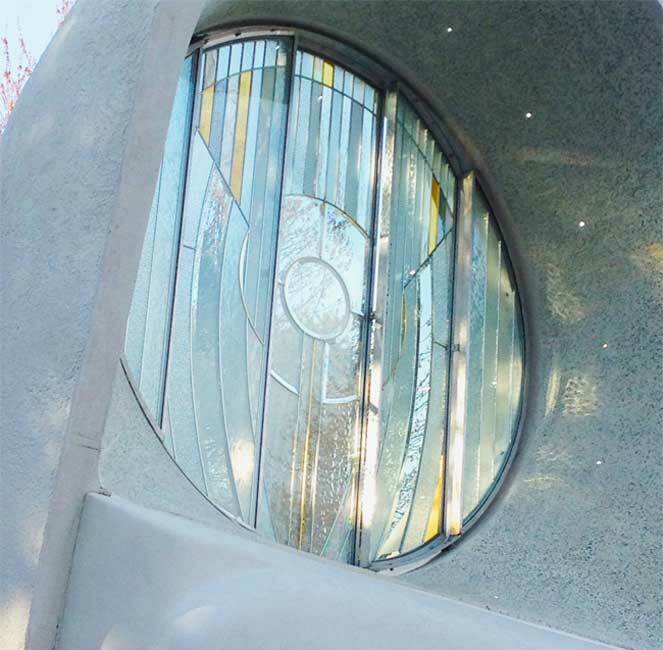 The structure is GFRC architectural light weight concrete with polished, embedded automotive glass from dodge cars, and rear view mirror pieces in the parabola. Selected from an array of designs by Tj, this piece took one year to construct along with the Hemi Piston Lamps. It is 20 feet by 12 feet by 10 feet. 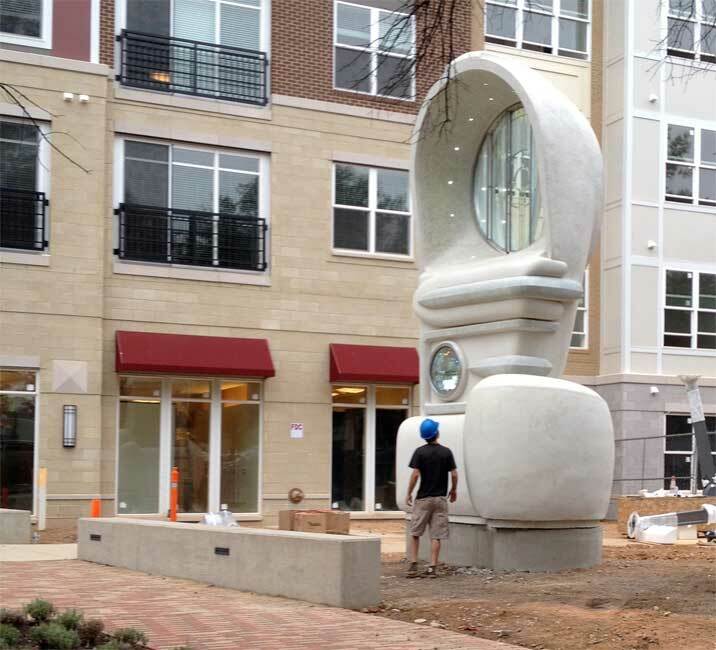 It was installed in Rockville, Maryland, just in front of the Shady Grove metro station to the Red Line that goes to Bethesda and Washington D.C.
Background: The Light Dodger was commissioned by the Bainbridge Companies of Bethesda to design a sculpture for the new residential complex at 15955 N. Fredrick Rd in Rockville, Maryland. The site is at the Shady Grove Metro station of the red line from Washington DC. The Bainbridge Companies wanted to honor the site history and hired Artist Circle Fine Art consultants to find a sculptor for the Auto theme. They found Tj Aitken. The work commemorates one of the oldest Dodge dealerships in the nation, Reed Brother’s Dodge 1915 to 2009. 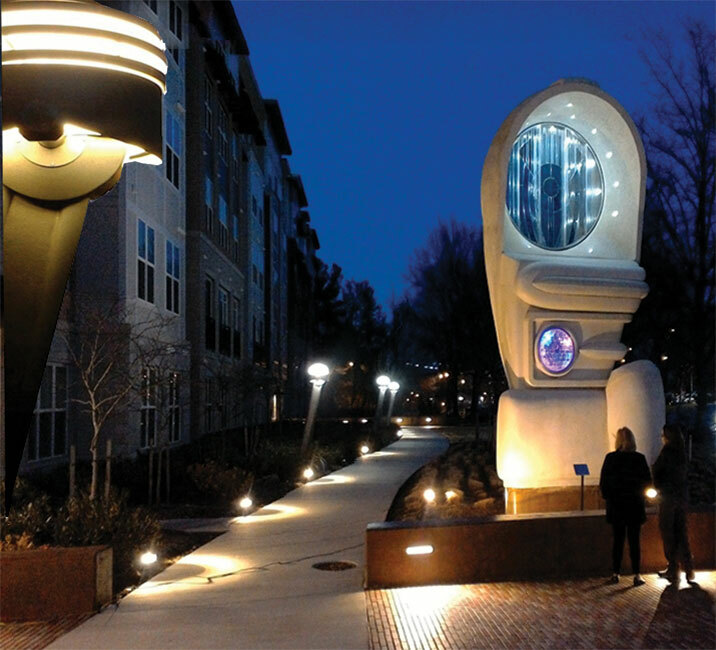 The project includes a large sculpture and a set of street lamps designed on a theme that commemorates history there. 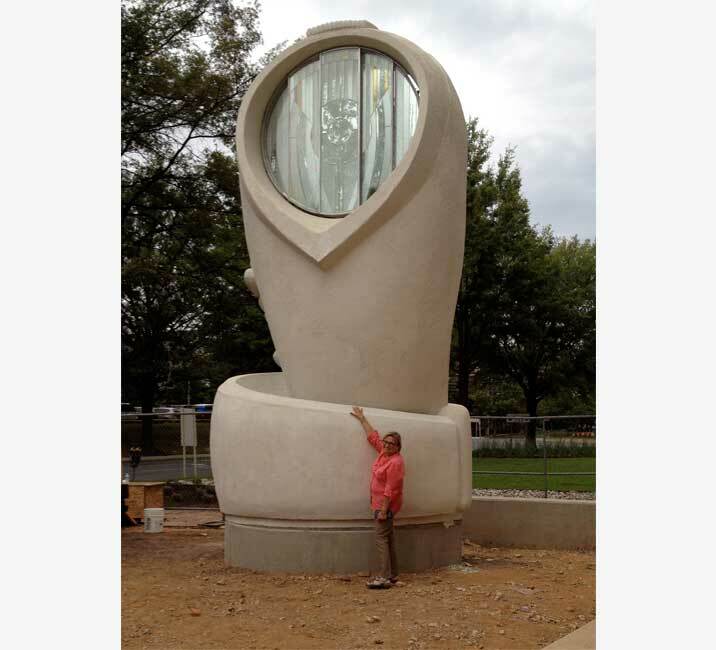 Tj was commissioned to do the exterior sculpture. He proposed several theme topics including Dodge engine, Car lot, and the Light Dodger series which is a group of pieces all created by combining two Dodge headlight designs back-to-back into one standing form. 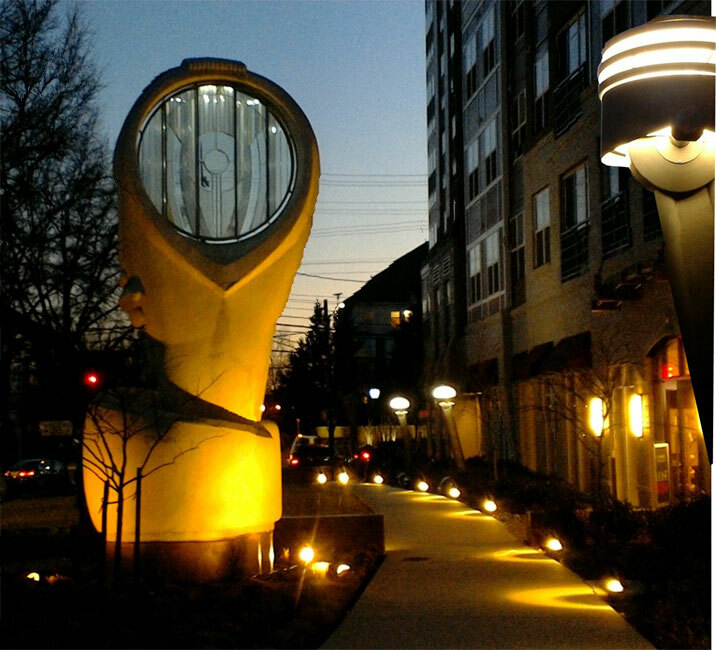 The Bainbridge group chose the Light Dodger '39/'57 as the main piece for the site but said the Street Hemi Piston Lamps were also a must for the walk way. The design development began in January of 2014. Tj’s studio fabricated the steel armature and had CAD drawings created for C&C laser cut parts for the piston lamps. Design studies were done and glass selected for the lens components. 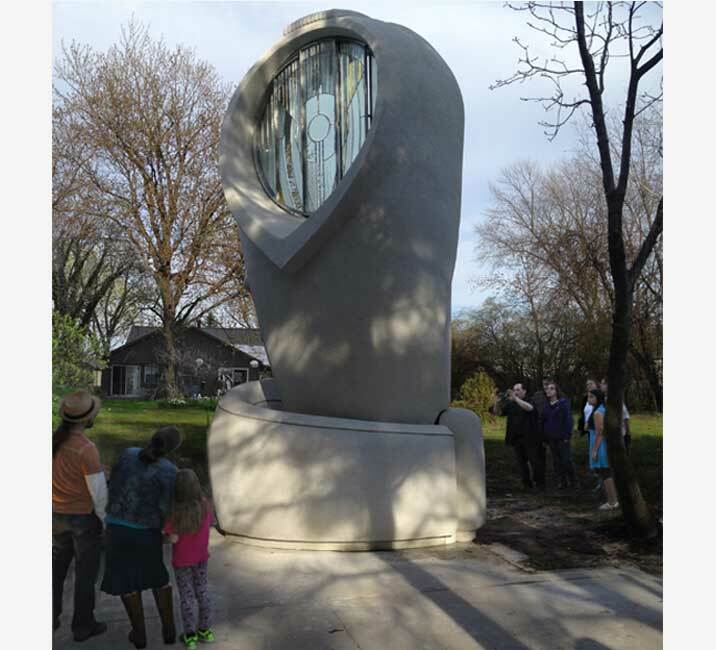 The Piece was transported and installed In August of 2015. A grand unveiling will happen when the complex is complete.